The title of this game provides you with almost everything that you need to know about this traditional 3 reel game. Click here to play! Spin sevens or BARS across the pay line and you'll bring in plenty of big money wins! 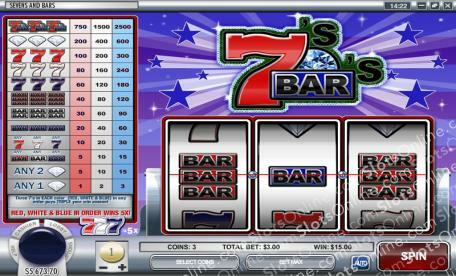 The top symbol in this classic slot game is the 7's and BARS logo. Spin three of these across the single pay line and you'll get up to 2500 coins. Next on the list is the diamond symbol. Three of these sparkling stones will bring in up to 600 coins. As you might expect, sevens are another big winning symbol. Spin three red, white or blue sevens for a chance to win up to 300, 240 or 180 coins respectively. If you get one of each in any order, you will triple your win amount. BARS are also on the list. Triple, double or single BARS will get you a pretty penny if you can spin three of them across the pay line. Also aiding you in your quest for cash are a few different combinations, including any seven, any BAR, any two diamonds or any one diamond. As this is a 3 reel game, you'll be wagering coins. Be sure to put in the maximum amount of three in order to bring in the biggest wins. So, spin a few sevens and BARS for a chance to substantially increase your bankroll!